George A. Kennedy (b. 1928) received his PhD from Harvard in 1954 and joined the Department in 1966, when he was hired to replace Albert Suskin as Chair after the latter’s premature death. 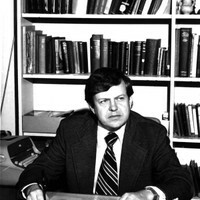 He was named Paddison Professor of Classics in 1973 and retired in 1995. He is an internationally recognized authority on the Graeco-Roman rhetorical tradition. Among his books are his three-part history of rhetoric in the ancient world: The Art of Persuasion in Greece (1963), the award-winning The Art of Rhetoric in the Roman World (1972), and Greek Rhetoric under Christian Emperors (1983), summed up in A New History of Classical Rhetoric (1994). Kennedy’s teaching reflected his wide range of interests, encompassing Classics, comparative literature, and rhetoric. He won a Tanner Award for Excellence in Undergraduate Teaching, and was a much sought-out graduate supervisor and mentor. He also had a notable career as an administrator, serving as Chair of the Department of Classics from 1966 to 1976, as Chair of the Faculty Council from 1985 until 1988, and as Chair of the Board of Governors of the UNC Press. Outside Chapel Hill, he served as president of both the International Society for the History of Rhetoric and the American Philological Association (1979), and editor of the American Journal of Philology (1989-1996). For a more detailed account see here. The George Kennedy Expendable Fund was established in Professor Kennedy’s honor in 2015. The use of this fund is largely unrestricted, allowing the Chair to make strategic investments that promote Department’s overall mission of teaching, research, and community outreach and engagement. In recent years we have used it for faculty retention and to support faculty research initiatives. Please consider making a gift online to the George Kennedy Expendable Fund (104427).